EMIRAT Handling & Fulfillment is your qualified partner with years of experience in the fulfillment business. We offer you the logistical support as well as our services fort he shipping of your products. Let our competent team work for you and trust in our service-offers as a market leader in Europe and Asia – For your success. EMIRAT Handling & Fulfillment is your strong and knowledgeable partner to support you with the handling and controlling of your logistics operations. From your stock receipt to shipment, from the management of returns and payment to customer service: As a fulfillment-supplier, we are always available for you! EMIRAT Handling & Fulfillment offers the backend support to all of your marketing projects. We take care of all your tasks from A to Z. We create Microsites and provide mailboxes. As a Clearing-supplier we are always available for you! EMIRAT Handling & Fulfillment supports all your handling processes as well as the processing of all your logistic tasks. We equip your POS-Displays according to your guidelines. The goods, as well as stand-up displays and flyers, will be delivered to us and we produce a complete display-product. EMIRAT Handling & Fulfillment takes care of Customer-Service and – Care for your business. According to your company’s needs, we will handle inbound and outbound services with our schooled employees. EMIRAT Handling & Fulfillment creates professional photographs of your products for your online store. High-quality pictures are a necessity for every shop and help you raise your profits. We act as a central contact point and take care of the complete handling of your marketing campaigns and payments. You benefit from our know-how and are able to refocus on your core business. We offer the all-around care-free-package! As a fulfillment service company, we handle all tasks concerning your online store. Starting with commissioning jobs up to managing your returns and refunds, we are the competent partner at your side. Not enough warehouse space? Use our comfort zone! We handle smooth processes from warehousing your goods up to shipping. You benefit from our 24/7 service. EMIRAT Handling & Fulfillment was founded in 2011 as an independent department of the EMIRAT AG. Soon followed project requests from more than 45 countries and EMIRAT AG became the market leader in Europe and Asia, offering a worldwide service. On top of our corporate headquarters in Munich, there are additional offices in London, Dubai and the US. EMIRAT Handling & Fulfillment is known for successful collaboration. We take care of the orders in your online store or handle the smooth execution of all your campaigns to help your company create more sales. Trust in our experience as a Clearing-, Handling- and Fulfillment-Specialist and simply outsource unwanted logistical tasks or unexpectedly high returns after a campaign to us. No matter if its the collection of data out of returns or the handling of shipping processes: You benefit by from our expert knowledge. We transform your plans into action. Individuality is needed! We create our quotation always individually, based on your needs and our range of services. This way we make sure your company receives exactly what is needed. Additionally, a very important part of marketing ist he handling of complaints. Are your customers unhappy? We intervene and increase client satisfaction with our custom service-solutions. Often times campaigns to increase sales are accompanied by risks that are incalculable. Companies are confronted with higher costs and unexpected workload. Only rarely a plan is put to action, exactly as it was supposed to. Are you interested in increasing the name recognition of your company and boosting your business? Don’t leave your success to chance! Trust in our experience and the know-how of EMIRAT while implementing your campaigns and ideas. It’s time for quality. 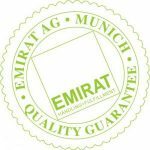 EMIRAT Handling & Fulfilment – That’s quality made in Germany. Our collaboration always applies where it’s needed. We consider individual needs and desires and always listen to your plans and expectations. Therefore we can provide exactly the services you need and support your company with Handling, Clearing, and Fulfillment. We solely work in-house. Our technical resources are up to all standards and include maximum data security. As a business partner, EMIRAT takes care of all your annoying tasks. Costly promotion-campaigns, a lack of warehouse-space or employees are no problem. We take care of your goods receipt and quality control and provide the needed warehouse space for your products. We pack up your products and handle the shipment. If needed, we take care of returns. You receive constant feedback and reportings, including analysis, so you can see how successful the collaboration has been. We would love to provide you with exactly the services your company needs and make you a quotation. You can focus on your key business. We answer each request personally. Each customer always brings unique challenges. We have an open ear for you and are always available.